Besides leading the Bruce Katz Band, Bruce performs regularly with the Delbert McClinton Band, Jaimoe's Jasssz Band, John Hammond, Maria Muldaur and other artists as well. He was a member of the Gregg Allman Band from 2007-2013. As you can see – and will soon hear – Bruce knows some stuff about some stuff. In a word, “Homecoming” is amazing. Period. The thirteen song disc covers the range of great blues piano/keyboards. To pick favorites is virtually impossible but I’ll highlight three for you. The first song that really caught my attention after the first of many listens to this disc is “Wild About You Baby.” The gritty dirty of this tune is so “there” that you can imagine hearing the wood floors creak and squeak in an old backwoods blues bar back in the twenties or thirties. I listened to this tune I don’t know how many times. If I were to pick a favorite off of “Homecoming,” this tune would definitely be in the running. The smooth, sultriness of “No Brainer” has very subtle hooks that won’t let go. It has the makings of a classic in the vein of the Pink Panther Theme and the like. Love this tune! Finally, but not lastly, is “Won’t Last Til Tuesday.” While I love everything about this song, I absolutely love Chris Vitarello’s guitar work on this cut. It’s melodic intricacies make this tune a heck of a lot of fun to listen to. 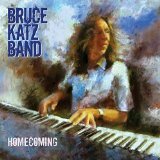 If you haven’t heard of the Bruce Katz Band before, I highly recommend picking up “Homecoming” as your first taste of him. After you give this album a few listens, you’ll want to pick up the rest of his work. I guarantee it.